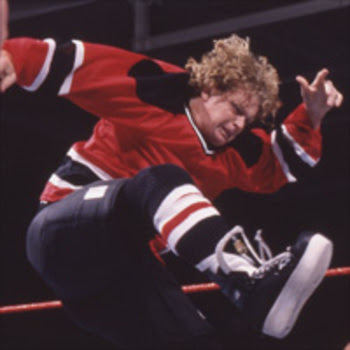 Banned from the NHL, The Goon left Duluth, Minnesota and hocky to head to the WWF where fighting was legal. 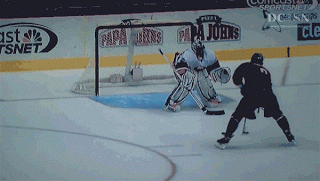 The Goon's "hockey thing" was going out on the ice and committing every penalty that exists. He wouldn't wear a helmet because he was a tough guy and he always held one nostril and blew boogers out of his nose. The Goon would come down to the ring (with no entrance music) wearing a hockey jersey. However it wasn't your typical hockey jersey. 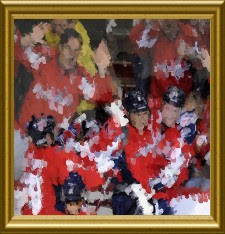 There was no team or logo on the front, just blank space. On the back, printed in letters about 3x the size of a normal last name was "Goon". The Goon had no number on his jersey. The worst and most cartoony part of this gimmick was The Goon's "ice skates." His boots were "platform boots" where the bottoms were white to look like a skate blade and the top was black like a regular boot with giant hockey skate laces. It was supposed to look like ice skates but it was laughable and looked like a guy wearing weird shoes. The lifts made for some odd walking & running as well. He also had hockey shorts, tights under the shorts and high hockey socks. Each trip to the ring The Goon would come out with his hockey stick, go in the ring, throw down his hockey gloves, and come out fighting. If you like hearing the word "cross-check" being used for any type of punch, hit, push, or contact, then you would have loved the broadcasting of the Goon's matches. Any time he would perform any maneuver the announcers would say he was cross-checking or body-checking. Just when you thought it couldn't get any worse, you get to see The Goon's Cross-Check finishing move. Unlike the Hogan Leg drop, or the Rock Bottom, this was just plain garbage. He would go outside the ring, run slowly and hit his opponent in the back knocking them into the side of the ring where they fell to the floor knocked out. While it was more of boarding, they still called it a cross-check. The Goon never actually pinned anyone. His finishing move made the opponent get counted out. Therefore as wrestling fans know, he theoretically could have never won a title belt with that move. What is more exciting for wrestling fans than a countout?